STEM-EDS spectra demonstrating a carbon-rich film developed on the surfaces of nanoparticles embedded within a landfill leachate plume, inverting the expected size-dependent reactivity sequence as a function of nanoparticle size. The larges particles reacted the most, due to the highest availability of uncoated surface area. In the Earth, environmental, and planetary sciences, vast amounts of materials are found in the length scale of 1-100 nm. These materials have novel properties because of their tiny size, leading to size-dependent reactivity. Nanogeoscience is the investigation of size-dependent properties and reactivity of nanomaterials found in natural systems. This scale- or size-dependent reactivity is unique to the nanoscale due to the rapid increase in the percentage of atoms exposed at the surfaces as particle size decreases to <100 nm, leading to changes in fundamental properties including atomic, electronic, and magnetic structure, thermodynamic phase stability, and interparticle forces. Investigating these properties and behaviors requires a particular set of techniques, which has led to the widespread growth of nanotechnology-based solutions to societal challenges. Tremendous investment in nanoscale science and technology centers across the world reflect the tremendous potential of nanoscale materials to impact science, engineering, and society. Bridging the gap between lab and field studies of size-dependent nanomaterial reactivity. Studies of nanoscale mineral reactivity primarily take place in the laboratory. Although some studies now investigate natural nanoscale minerals, linking the presence of a nanoscale mineral with its biogeochemical reactivity in field settings remains challenging. 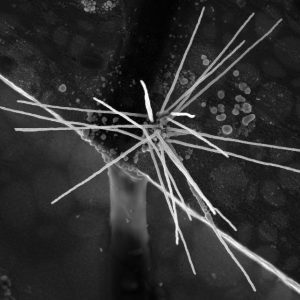 Our group’s most recent efforts are bridging the gap between field and laboratory experiments, with initial studies suggesting that organic molecules are key to understanding nanomineral reactivity in the soil/ sediment environment. Ph.D. student Andrew Swindle designed field-deployable nanoparticle sample holders containing pre-loaded TEM grids with various sizes of well-characterized magnetite nanoparticles. Andrew investigated the size-dependent reactivity of magnetite at the U.S. Geological Survey’s Norman Landfill site in cooperation with USGS scientists, finding that size-dependent reactivity trends observed in the lab were reversed in the field due to size-dependent interactions with organic matter. In a second study (also published in ES&T), we determined the properties of lab-derived organic matter do not reflect the physical properties of organic matter in the field, preventing laboratory simulation of relevant conditions. In spring 2018 we initiated field-based size-dependent reactivity experiments at an amazing sulfidic/methane-rich spring in Western Oklahoma. A nanoscale hematite rosette found in Central OK Aquifer sediments; this hematite contains Cr(III) that is only toxic when oxidized to Cr(VI). Elevated levels of hexavalent chromium (the “Erin Brokovich” chemical) due to water-rock interactions exacerbated by heightened rates of pumping may limit the availability of usable groundwater in water-stressed central Oklahoma. Our combined field collection of colloids from groundwater, experiments with outcrop materials, and mineralogical/geochemical investigations of sediment cores are allowing undergraduate and graduate students to test several hypotheses to investigate chromium cycling processes in the Central Oklahoma Aquifer. To date, we (M.S. student Jeff Westrop taking the lead) have demonstrated that the dominant mechanism for hexavalent chromium release is cation-exchange driven dolomite dissolution that releases Mn(II) and produces fresh Mn-oxide minerals and developed a thermodynamic model that explains Cr distribution in the context of regional groundwater chemistry (manuscript in preparation for ES&T). Contrary to a widely espoused hypothesis, our results show that Cr(VI) is not controlled by incorporation into barite-type minerals (even in though are samples were collected within the famous Oklahoma barite rose belt). Our results also demonstrate that nanoscale mineral colloids are transported through groundwater deliver Cr(III) to the municipal water supply system (manuscript in preparation, Journal of Colloid and Interface Science). As part of the interdisciplinary, multi-institutional “BuG ReMeDEE” research consortia, we will be exploring the reciprocal interactions between minerals and methane-oxidizing microbes in extreme environments. Our group’s particular focus is on relationships between the chemistry of the groundwater, rocks, and colloidal minerals with the occurrence and distribution of methane-oxidizing microbes. We have completed initial field sampling deep underground at the Sanford Underground Research Facility in South Dakota (formerly Homestake gold mine) and anoxic Zodletone spring in Oklahoma. 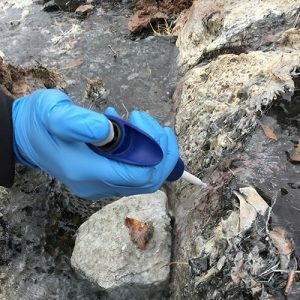 Ongoing studies involve the use of stable isotopes to identify methane oxidation in modern extreme environments and understand the roles of anaerobic microbial process in trace metal distribution between groundwater and sediments. Furthermore, we are working with microbiologists to understand the reciprocal interactions between trace metals and microbial diversity in extreme anaerobic environments (Zodletone, SURF, Norman Landfill). Nanodiamonds extracted from the recent sediment layer in the OK Bull Creek Valley. Our team (including Lee Bement at the Oklahoma Archaeological Survey, Brian Carter at OSU, and Alex Simms at UC-Santa Barbara and several students) investigated the controversial hypothesis that an extraterrestrial impactor resulted in climate/ cultural changes observed at many sites in the northern hemisphere approximately 13,000 years ago (the Younger Dryas). This controversy captured the interest of climate scientists, anthropologists, and the general public, as was featured on the PBS documentary “NOVA”. Nanodiamonds are known to form by various processes in outer space, such that their presence in specific sediment and soil horizons may be a signature of extraterrestrial impact. At the Bull Creek, Oklahoma site with well-controlled carbon dates and sedimentological contexts we found abundant nanodiamonds in the Younger Dryas horizon – but nanodiamonds were also abundant in the most recent layer. Our first manuscript regarding the nanodiamond work is now published in PNAS. M.S. 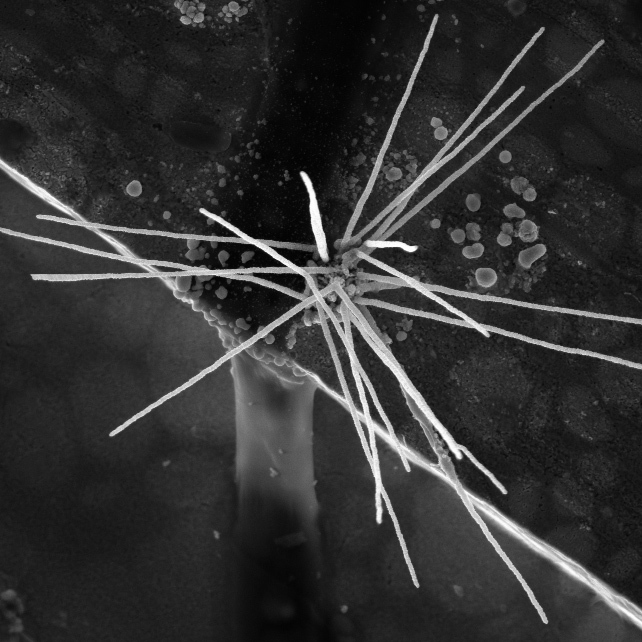 Student Molly Sexton further investigated the textures of nanodiamonds, demonstrating distinct textural patterns between Younger Dryas and more modern nanodiamonds. Combining multiple methods allowed us to better understand the controlling factors that explain the shapes of hematite spectra from Mars. The story of hematite on Mars provides a long and ongoing evolution in our understanding of links between mineral properties such as mineralogy, chemistry, and texture with their spectral characteristics. Ultimately, researchers continue to use these links to interpret the geologic history and present activity of water on Mars. We (co-Is Vicky Hamilton, Megan Elwood Madden, and Barry Bickmore) synthesized hematite nanoparticles with a range of shapes and sizes, then collected Raman, TIR, and XRD spectra of all samples. 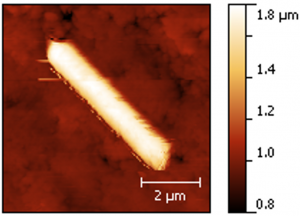 We demonstrated by TEM/HRTEM that only the smallest platy particles experience extensive crystallographic orientation during freezing/ cryodesiccation. This implies that If TIR spectra of other sizes and shapes show the 390 cm‑1 feature, it is can be generated by other textures. 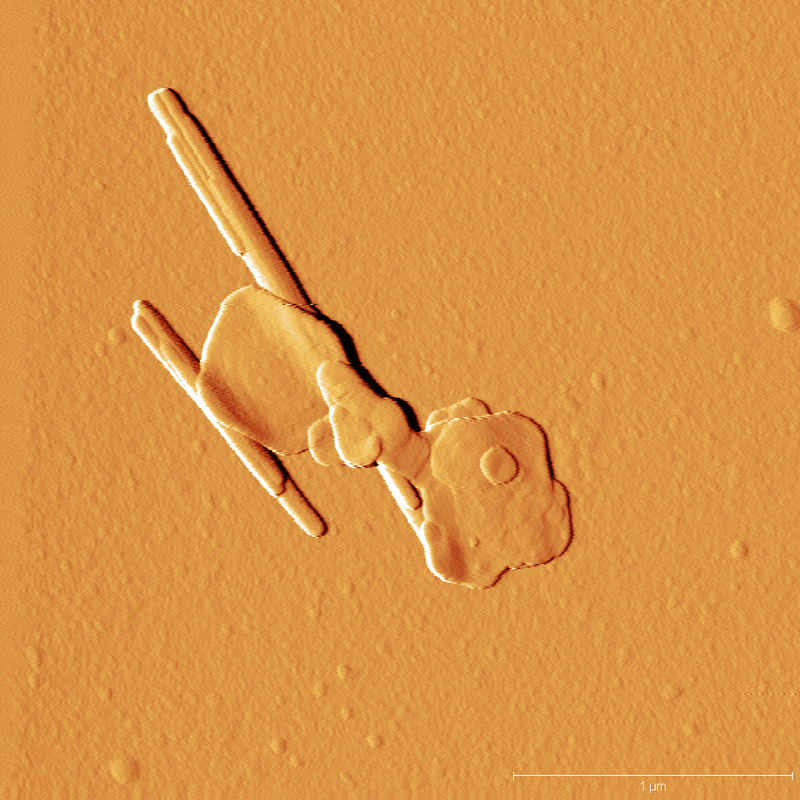 TIR spectra of all nanoparticle aggregates studied were missing the 390 cm-1 emissivity minimum; therefore, the lack of a 390 cm-1 band from coarse hematite on Mars may be due to a wide range of hematite properties, including particle size and internal disorder, as well as c-axis orientation. Comparison of Raman, TIR, and XRD analyses of hematite nanoparticle syntheses and aggregates demonstrates that the size and degree of crystallite aggregation within nanoscale particles affect the observed XRD pattern and vibrational spectra. 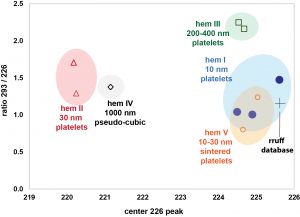 This leads to broader XRD patterns and less ordered vibrational spectra for some of the larger hematite nanoparticles compared to smaller hematite nanoparticles. Aggregates of hematite nanoparticles pushed into a rounded ball due to freezing of surrounding ice. 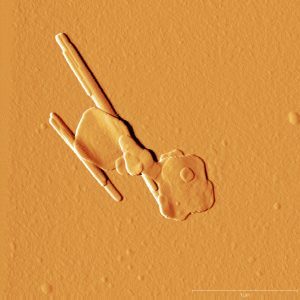 Did the hematite spherules on Mars form by freezing? Probably not. 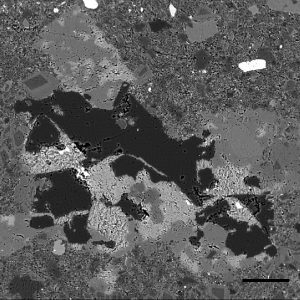 The enigmatic and unexpected occurrence of coarse crystalline (gray) hematite spherules at Terra Meridiani on Mars in association with deposits of jarosite-rich sediments fueled a variety of hypotheses to explain their origin. In this study, we (co-Is Vicky Hamilton, Megan Elwood Madden, and Barry Bickmore with M.S. student Molly Sexton) tested the hypothesis that freezing of aqueous hematite nanoparticle suspensions, possibly produced from low-temperature weathering of jarosite-bearing deposits, could produce coarse-grained hematite aggregate spherules. 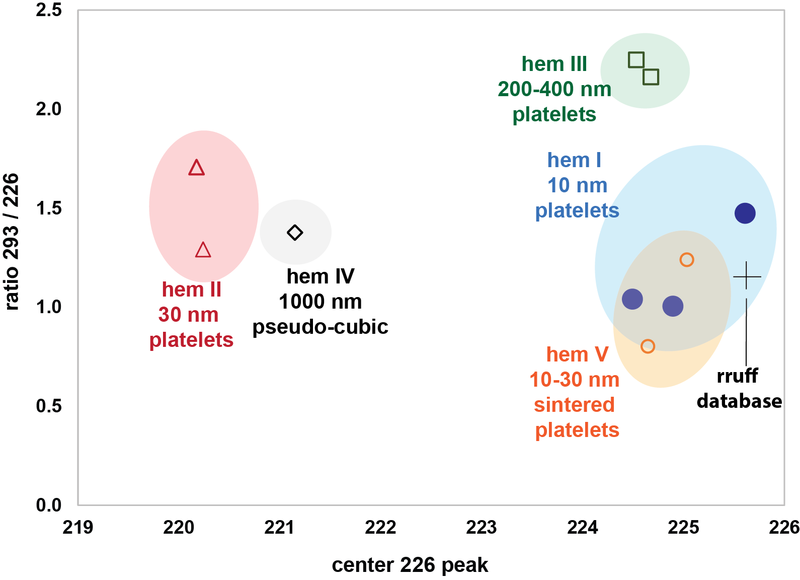 We synthesized five hematite nanoparticle suspensions with a range of sizes and morphologies and performed freezing experiments. All sizes of hematite nanoparticles rapidly aggregate during freezing. Regardless of the size or shape of the initial starting material, they rapidly collect into aggregates that are then too big to push in front of a stable advancing ice front, leading to incohesive masses of particles, rather than solid spherules. We also explored the effects of “seed” silicates, a matrix of sand grains, various concentrations of NaCl and CaCl­2, and varying the freezing temperature on hematite nanoparticle aggregation. 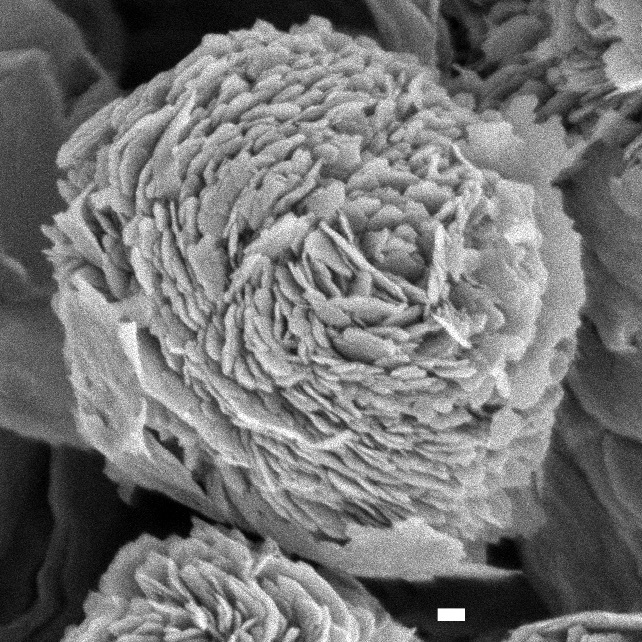 However, none of these factors resulted in mm-scale spherical aggregates. 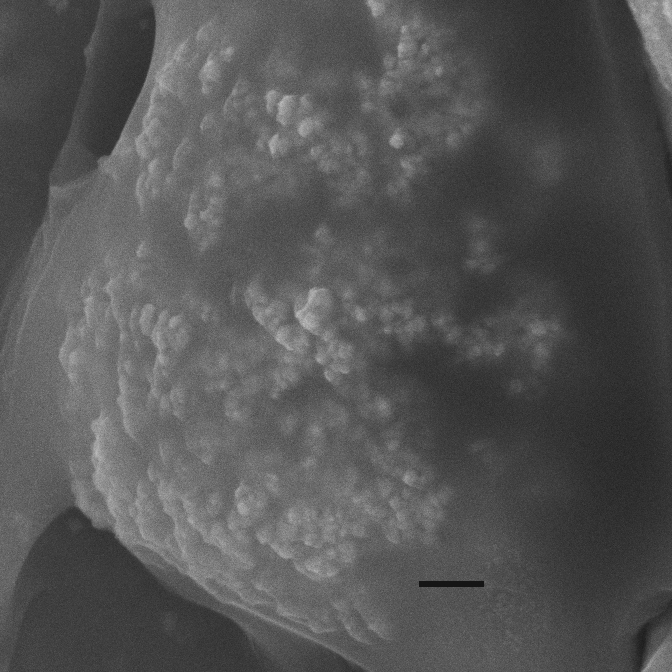 By comparing our measured freezing rates with empirical and theoretical values from the literature, we conclude that the spherules on Mars could not have been produced through the freezing of aqueous hematite nanoparticle suspensions; ice crystallization front instability disrupts the aggregation process and prevents the formation of mm-scale continuous aggregates. Dynamic interplay between uranyl phosphate precipitation, sorption, and phase evolution. Examples of uranium-rich natural systems with extremely low groundwater uranium concentrations suggest that uranyl phosphates precipitation have the potential to limit the uranium concentrations in oxic systems over geological timescales. Using geochemical models of aqueous chemistry, combined with AFM, TEM, and XRD observations, our experiments demonstrated uranyl phosphate phases those typically formed in lab experiments evolve to form those more typically found in field occurrences, providing support for phosphate-based uranium remediation practices. Thermodynamic modeling of aqueous concentrations over time demonstrated exciting jumps that likely represent nucleation of less-soluble forms that require further investigation. EPMA elemental mapping of murdock thin sections was used to determine textures important for TCE retention. Relationship between sediment mineralogy and extractable trichloroethylene contamination in a fractured aquifer. This work began with M.S. student Matt Miller’s summer internship with the USGS at the Naval Air Warfare Center in New Jersey, then continued with the work of other students and USGS collaborators. Using XRD and EMPA analyses from sediment cores and TCE data provided by the USGS, we demonstrated that the residual concentration of TCE after extensive pump-and-treat remediation in cyclically-bedded fractured sedimentary rocks of the Lockatong Formation, was related not to abundant smectite distribution, but rather to the presence of pore-filling cements that produced texturally important nanoscale pockets that sequester TCE. 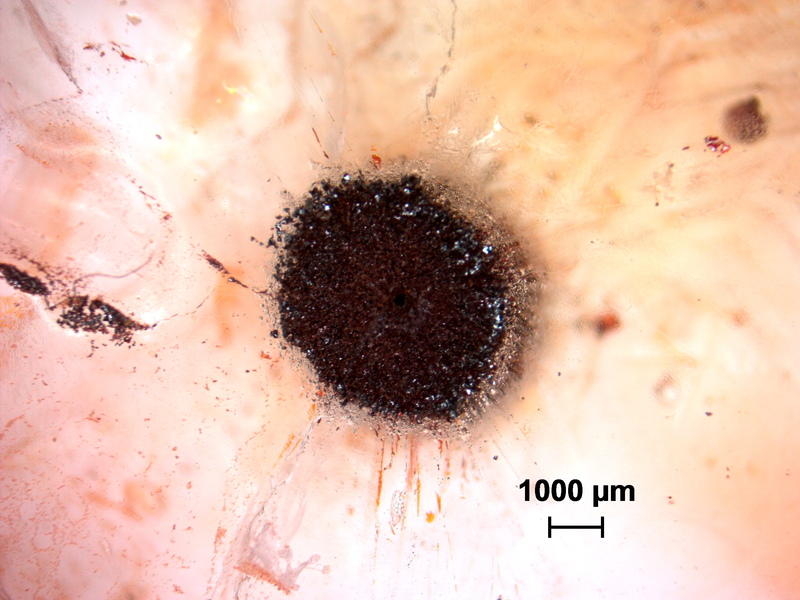 The distribution of these pores is controlled by textures attained during deposition, near-surface bioturbation, and fracturing (manuscript in preparation, ES&T). We found the current diagenetic models for the Lockatong to be inadequate, as they are based on an incorrect assumption that smectite was pervasively illitized throughout the region. In future work, I plan to collaborate with Dr. Qinhong Hu and NAWC site scientists to explore the response of these pores to solution chemical manipulations for rapid and effective residual TCE extraction. 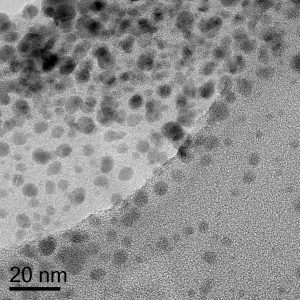 Hematite nanoparticles and Cr-Fe precipitates in an organic matrix from Cr(VI) reduction experiments. A project funded by DOE (Butler-PI, Krumholz, Hansel, and Madden, Co-Is) investigated chemical and biological reactions that lead to the sequestration of chromium in mixed Cr-Fe minerals. The hexavalent form of chromium is relatively mobile and toxic, while the trivalent form is both an essential nutrient and less soluble in water. We demonstrated that while biological and mineralogical chromate reduction led to similar Cr(III)-Fe(III) mixed hydroxides, abiotically produced precipitates were vastly more susceptible to reoxidation by Mn oxide. Atomic force microscope image of a roll made of nanoscale fault gouge particles. Development of these rolls along experimental fault zones led to increased fault slip, a process that may occur in natural fault zones. Nanoscale rock friction. Increasingly, Earth and environmental scientists from a range of sub-disciplines agree that nanoscale approaches are needed to understand earthquakes. I have been collaborating with Ze’ev Reches’ group to investigate the properties of nanoparticulate gouge and friction along fault surfaces produced during rock mechanics experiments simulating earthquake conditions. While many mechanisms have been proposed to explain the weakening (i.e., lowering of friction) observed during fault slip, these proposed processes operate at scales inaccessible to previous measurement techniques. We used a nanoscale AFM-based friction measurement method applied to experimental fault surfaces and compared the results to macroscopic rock friction measurements collected on the same materials. These measurements extend rock friction measurements to >3 orders of magnitude smaller scale than previously recorded, relating friction measurements directly to observable textures. More recent work has demonstrated that during slip of siliceous rocks, nanoparticulate mineral gouge particles collect to form nanoscale roller bearings that weaken the fault, providing the physical explanation for “powder lubrication” observed in experimental earthquake studies (manuscript in press for an AGU monograph).